If you are anything like me, you can't remember why you are going to the bank, have to check the freezer to see if you need to buy chicken or if you just need to cook it, and can't ever send the letter to Bob because you keep forgetting to buy stamps! 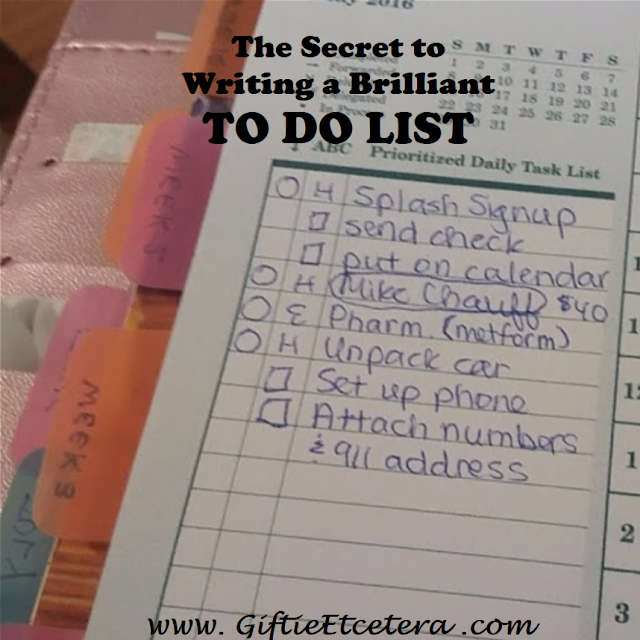 There is a better way to write a to do list. The keys to writing a task (whether a single task or a task that takes multiple steps - something I'll discuss below) are starting with a verb and adding enough detail. Action verbs give you immediate guidance about what needs to be done. Add enough information to make sure you know exactly what to do when the time comes. For example, I might always deposit my paycheck, so I don't need to write down which check. But maybe I need to know that I am writing the letter to Bob to complain an extra charge on my electricity bill. If something takes a lot of steps, like planning a birthday party, it is a project. I've written extensively about project pages. It's great to plan out a project step-by-step, but are you really going to check your project pages every day? I bet you won't! Instead, create project pages, but put the name of the project on your task list on the next date when you need to work on the project. Sometimes there is a multistep task that just isn't big enough for a project. For example, today I need to refill a certain prescription. The problem? I also have to pre-approve the script and, after filling it, sort it into a weekly pill box. Here's how I handle it. All the steps are there. The circle indicates the multi-step task, while the steps are listed after squares. Since each step is waiting on a prior step, I use an @ to indicate what I am waiting on. Usually, five steps is about my limit. If it takes more steps, I do a project instead. TIP: Do the same multi-step project every month? Make several copies of a checklist and use that each month. Takes notes in your planner on these rules! They are worth learning and remembering. I've had the problem of writing something down in my planner, and then not remembering exactly what it was because I didn't include enough info. I usually have a list of e-mails that need to be sent, and if it's not a simple response, I have to put a little bit of the subject by the name. I also need to write down receptive tasks. I probably won't forget them, but I might not take the time into account when planning other things. I've started to use verbs for to-do lists for the past year or so. It really does help. But, you're added idea of the multi-step task is brilliant. I need to use this. I realize now why I get so muddled tackling things on my to-do list sometimes. Thanks for the great tips! Your way of including the mention of a project is brilliant. Thank you.